Lao-tze was born in the hamlet Ch‘ü-Jan (Good Man's Bend), Li-Hsiang (Grinding County), K‘u-Hien (Thistle District), of Ch‘u (Bramble land). His family was the Li gentry (Li meaning Plum). His proper name was Er (Ear), his posthumous title Po-Yang (Prince Positive), his appellation Tan (Long-lobed). In Cheu (the State of Everywhere) he was in charge of the secret archives as state historian. Confucius went to Cheu in order to consult Lao-tze on the rules of propriety. 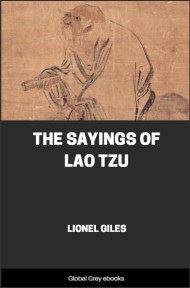 [When Confucius, speaking of propriety, praised the sages of antiquity], Lao-tze said: "The men of whom you speak, Sir, together with their bones, have mouldered. Their words alone are still extant. If a noble man finds his time he rises, but if he does not find his time he drifts like a roving-plant and wanders about. I observe that the wise merchant hides his treasures deeply as if he were poor. The noble man of perfect virtue assumes an attitude as though he were stupid. Let go, Sir, your proud airs, your many wishes, your affectation and exaggerated plans. All this is of no use to you, Sir. That is what I have to communicate to you, and that is all." Confucius left. [Unable to understand Lao-tze], he addressed his disciples, saying: "I know that the birds can fly, I know that the fishes can swim, I know that the wild animals can run. For the running, one could make nooses; for the swimming, one could make nets; for the flying, one could make arrows. As to the dragon I cannot know how he can bestride wind and clouds when he heavenward rises. To-day I saw Lao-tze. Is he perhaps like the dragon?" Lao-tze practised Reason and virtue. His doctrine aims at self-concealment and namelessness. Lao-tze resided in Cheu most of his life. When he foresaw the decay of Cheu, he departed and came to the frontier. 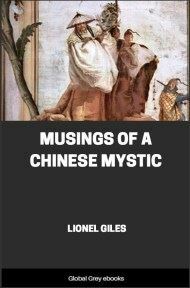 The custom house officer Yin-Hi said: "Sir, since it pleases you to retire, I request you for my sake to write a book." 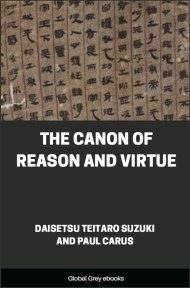 Thereupon Lao-tze wrote a book of two parts consisting of five thousand and odd words, in which he discussed the concepts of Reason and virtue. Then he departed. No one knows where he died.